Care Flight announced the ribbon cutting of their new 24-hour flight crew quarters, located at the Truckee Tahoe Airport. Care Flight established the Truckee base in 2003. At that time, it was not a 24/7 operation. By 2006 when the operation went 24/7, crews needed overnight accommodations. A variety of short term solutions were used, including the use of a local fire station. Care Flight is in its 31st. year of operation. It was started in Reno to serve rural areas of Northern Nevada and Northeastern California. It has grown to 4 bases, three of which are in Nevada. Their helicopters are AS 350 Astar’s, known for their hot weather and high altitude capabilities. They are equipped with GPS navigation, weather radar, terrain avoidance warning systems and night vision goggles. Care Flight trains with numerous rescue agencies including local ski patrols and avalanche rescue dogs and their handlers. 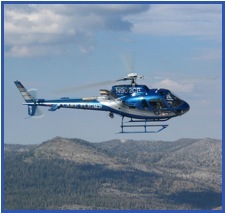 Care Flight provides safety coverage for special events such as Burning Man, Reno Air Races, and the Death Ride. If you feel unlucky, you can purchase a “membership plan” for $55 dollars that will pay out-of-pocket expenses (insurance deductibles) for emergency air transport.